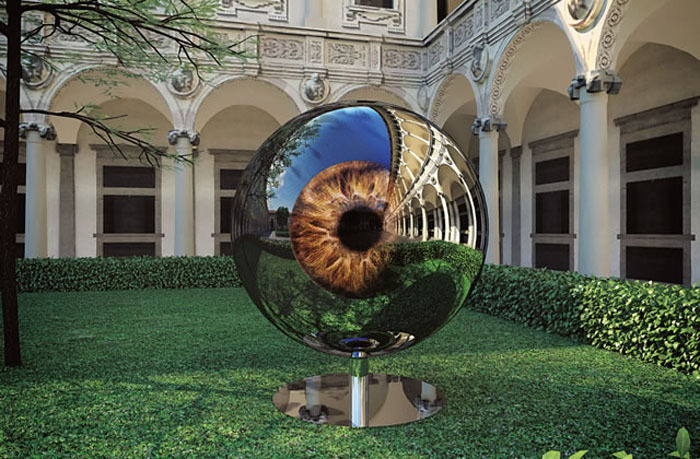 As part of this year’s Interni Legacy event at the Università Statale in Milan, in conjunction with Milan Design Week, Sergei Tschoban and Sergey Kuznetsov, partners of the Moscow based architecture studio SPEECH Tchoban & Kuznetsov, have designed a high-tech sculpture titled The Architect’s Eye. 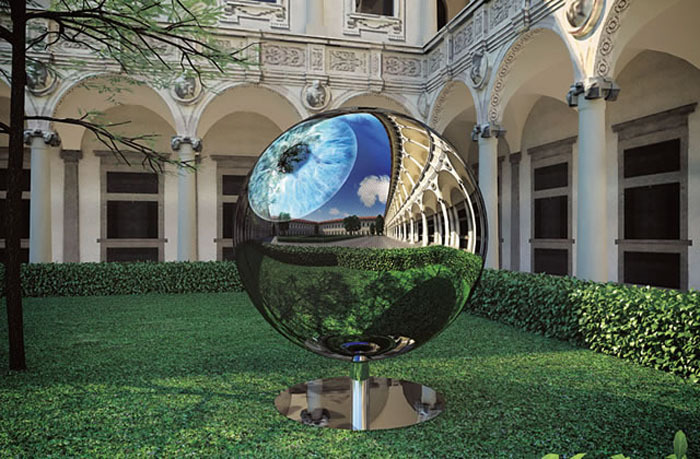 A stainless steel sphere, completely smooth and reflecting, features an LED system to create the image of a huge human eyeball that rotates to look to the sky as well as at visitors and the ground. The iris changes color and the pupil increases and decreases in size. Very cool. The theme of Interni Magazine’s event is ‘legacy’ and SPEECH’s sculpture dutifully works that in by including images and video of abandoned monuments of the Russian avant-garde, commenting on the importance of preserving our history and cultural legacy. This entry was posted in Architecture, Art, Event, Interaction Design, Just Plain Cool. Bookmark the permalink. The modern eye of Sauron!